Here it is- the eagerly-awaited second BEST giveaway. 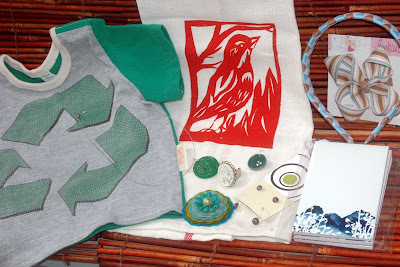 Featuring an awesome kid's shirt from SweetPepita, made of a repurposed t-shirt and organic cotton; a printed dishtowel from JennyJen42 (why use paper ones? ); a notepad from JenyGWen, pendants from Anapurna and GwenWalls, earrings from JillPopowich, headband and bow set from CookiesBowBoutique, a recycled plate ring from TheBrokenPlate, and a brooch from JenMenkhaus.